Anyone who has spent any time at all learning the rivers and lakes of the Cascades south of the Columbia and north of Mt. Jefferson knows who Robert Campbell is. Now you can see the Clackamas River and the Sandy through his eyes, but you also get to walk with him, figuratively, as he unlocks the secrets of the Zigzag and of Badger Lake and others. Lewis’ influence is felt in more of the eastside chapters, but you get a glimpse of how he spent his youth, beating the brush with a fishing rod in hand and a box of flies or spinners in his hip pocket. 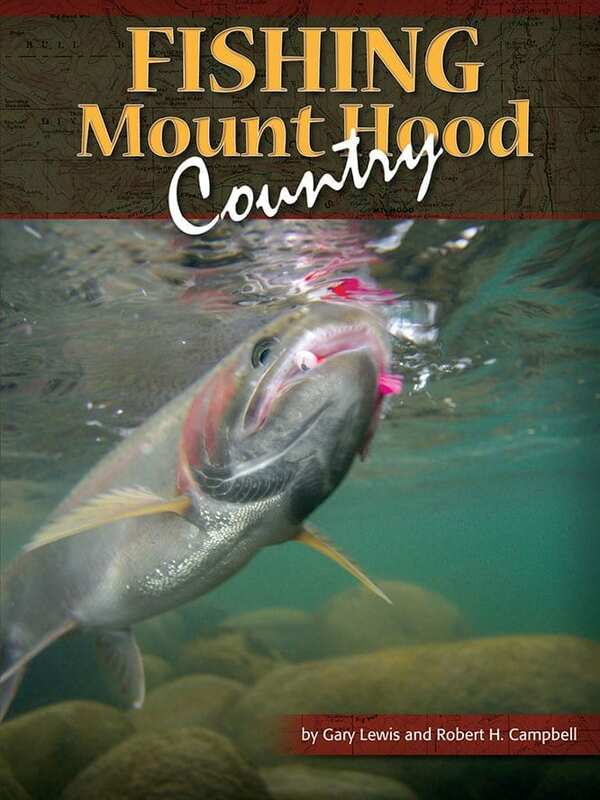 This book also has contributions from Dave Kilhefner (that’s his shot of a wild Sandy River steelhead on the cover), from Terry Otto (Smock Prairie Reservoir) and Blake Miller, who describes how to find hidden still water jewels with just a map and a GPS in hand. Which brings up a point. There is more water on and around Mount Hood than one person could get to know in a lifetime. 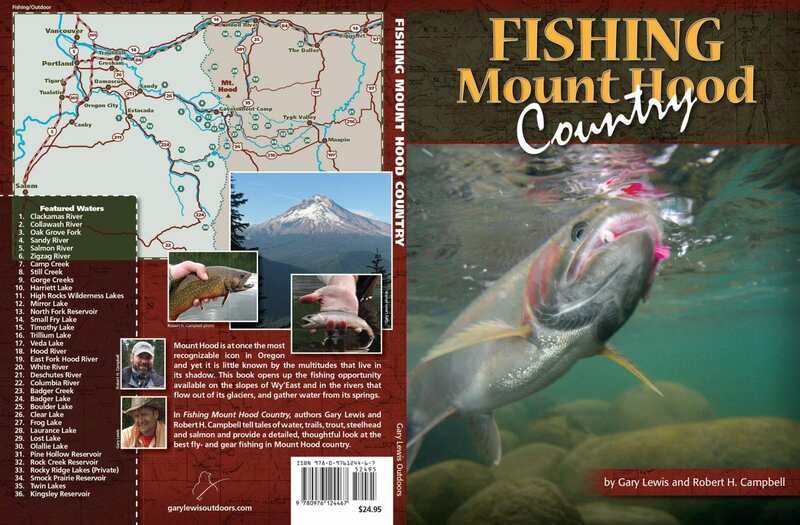 Fishing Mount Hood Country touches on some of the waters we’ve all heard of and a few, I confess, some I’d never heard of before. Campbell and Lewis strike a balance that defines or outlines 40 fisheries and whets the appetite to discover dozens of others not discussed in these pages. The whole book is presented in color with one or more pictures on every page. It’s obvious the authors spent a lot of time on this project. Take a look at the close-up shots, the details of fins and tails; each one of those fish are representative of the waters they were taken from. And they are all different, reflecting the habitats they come from. There are several good examples of coastal cutthroat, for instance, and not a one of them looks like another, because every one is a jewel, a gift. 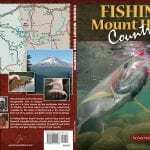 And this is the real spirit of Fishing Mount Hood Country. You sense that the authors and contributors have never lost their sense of awe. Gary Lewis grew up on the north bank of the Columbia and moved to Oregon at the age of 19. He is twice past president of the Northwest Outdoor Writers Association and is a recipient of the Enos Bradner Award. He is host of Frontier Unlimited TV and the author of 16 books. Robert H. Campbell, a lifelong Oregonian, grew up on the west side of Portland, Oregon, and has spent a good part of his life working and playing in Mount Hood country. 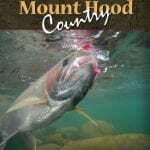 His work has appeared in regional magazines and he is a regular contributor to SalmonTroutSteelheader. His book Illustrated Rigging has remained on the best seller list of Frank Amato Publications since 2007.